Big Time has released another online slot game. This time it’s The Final Countdown. The Final Countdown comes with 4096 ways, 6 reels, which are all 4 symbols high. And it uses a retro space theme with the famous The Final Countdown soundtrack. The Final Countdown is also called Danger! High Voltage 2, because it’s seen as a follow-up of this hugely popular other Big Time Gaming slot game. The game comes with several different features and bonuses. I will list them below. During any spin there is chance that a reel clone will produce between 2 and 4 identical reels between reels 2, 3, 4 and 5. Scatter symbols can also be cloned. Wild symbols can expand horizontally and vertically based on the numbers of reels clones. x4, x27 or x256 for 2×2, 3×3 or 4×4 wild symbols. You will be awarded with 8 free spins. The countdown starts at 10. Each scatter symbol will reduce the countdown between 1 and 3. Once the countdown reached zero the feature will retrigger. This feature will start with a 2×2 roaming wild symbol on reels 2, 3, 4 and 5. This symbol will move around during every free spins on these reels. After each retrigger this wild symbol will grow, from 2×2 to 3×3 to 4×4, the same as the Clone Wilds. You will be awarded 15 free spins. A Reel Clone will occur during each free spin. A special velocity wild may appear on a cloned reel and will grow between x4 up to x888 at random. 3 or more scatter symbols will award 15 more free spins. 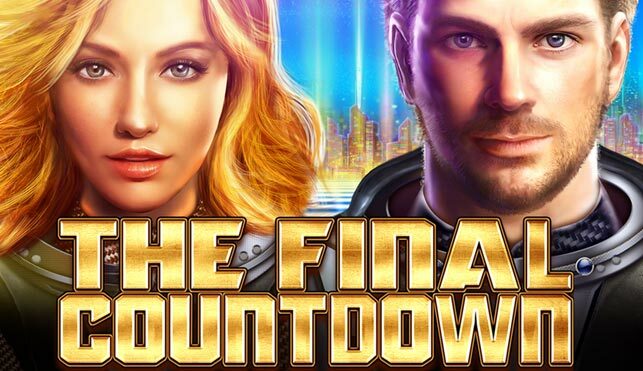 The Final Countdown is another amazing Big Time Gaming slot game. I love this game! I already loved many titles from this provider, especially Danger! High Voltage and Bonanza. But maybe this is my new favorite now. You have to try this game! Watch the YouTube video below for an impression of the game or play the game for real or for fun at Casumo.